At 14cm (6in) the Southern Masked Weaver (Ploceus velatus) is a common resident breeding bird of South and Southern Africa's numerous wildlife species. Of the taxon 'Ploceidae' or 'Weavers' of which there are many species around the world, the Southern Masked Weaver is widespread over virtually all of South Africa, which can count its self fortunate to have approximately 10 other 'Ploceus' species besides the Southern Masked Weaver. Male weavers are when breeding generally bright striking yellows, black and or reds in colour and the yellow and black of the Southern Masked weaver is one of its striking features. Females are not nearly as striking as the males of the species as we so often find in nature. Mother nature has provided the Southern Masked Weaver with all the necessary tools required for its survival. The Southern Masked Weaver is what is known a 'Passerine' a species of bird which includes more than half of the worlds bird species. One of the most notable features of 'passerines' is the toe arrangement, this arrangement of three toes pointing forwards and one backwards helps facilitate 'perching' thus the Passerines like the Southern Masked Weaver are commonly known as 'perching' birds for which the Southern Masked Weaver is very apt. Further notable features of the Southern Masked Weaver is its 'bill,' it is generally known as a 'seed' eating bird for which it strong 'conical' shaped bill is ideally suited for cracking those hard grass seed husks which it feeds upon. 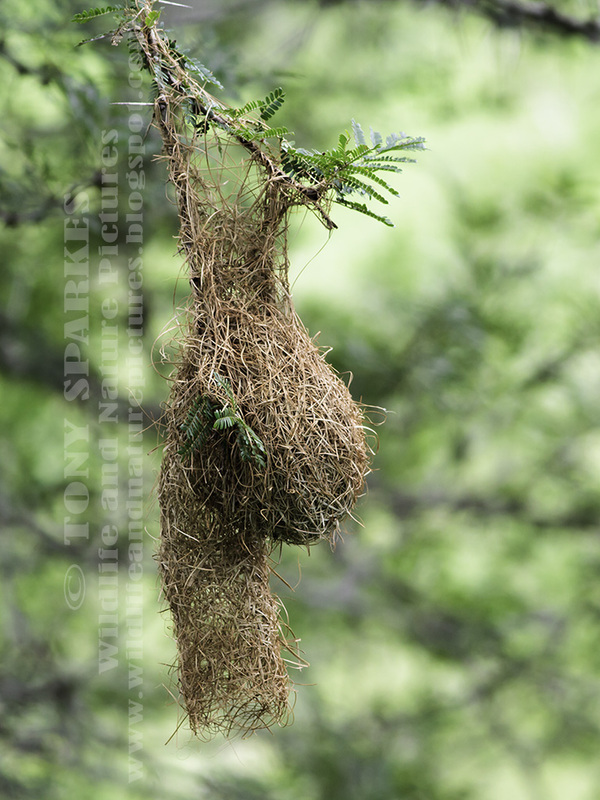 Also it is possible sometimes to tell which species of weaver bird is in 'residence' purely by looking at the shape of the nest as certain weavers have a 'signature' style. 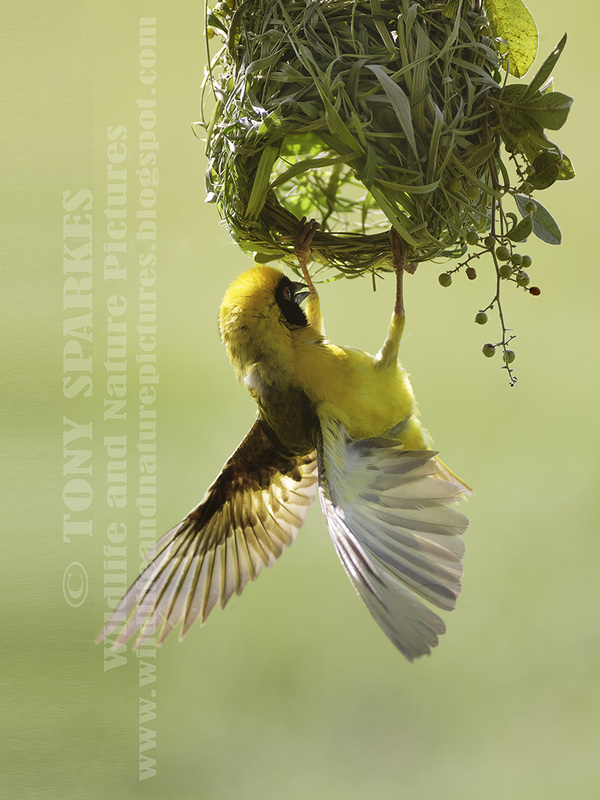 This brings me on to the nests of the Southern Masked Weaver, for this is what weavers generally are most renowned for, nest building. The Southern Masked Weavers nest is generally constructed of intricately woven grass, and lined with feathers by the female and the entrance of the nest is always facing downwards, certain other weavers also use leaf fibre, and fine twigs. Like most weavers the Southern Masked Weaver is a gregarious sociable bird and they build their nests close together often on the same branch and often over bodies of water, which of course being so close together affords them a certain degree of protection as well. The male breeding Southern Masked Weaver has several breeding partners (known as Polygyny not Polyandry) during the breeding season, which maybe between as many as 20-30, for which this little industrious bird builds nest for each and everyone of his females partners. Sometimes parasitised by cuckoos the female Southern Masked Weaver has a clever trick 'up her sleeve' or should I say 'under her wing' she actually lays different coloured eggs and the cuckoo has no way of knowing what colour the eggs are until it enters the nest to lay one itself.